No homestead should be without a collection of herbs, whether planted in your garden or grown in pots along the kitchen window. A variety of herbs can attract beneficial insects, act as companion plants, are aesthetically pleasing, and can compliment essentially any dish or drink. But maybe most of all, herbs can provide incredible healing properties. Herbs have historically been valued for medicinal purposes, and still today are used to treat everything from the common cold, to allergies, arthritis, and depression. The phytochemicals in herbs provide their medicinal properties, and tend to be more effective when used in their entire natural state. During the metabolic process of various herbs, our bodies are able to absorb these medicinal chemicals similar to our digestive process . Therefore, because we ingest and breakdown herbs like we do conventional medicines, many believe herbs to be just as powerful. Moral of the story- you can have your lemon rosemary glazed cake and eat an herb that improves concentration, strengthens hair and skin, and relieves joint pain, too. Sun-loving tender annual is a valuable addition to any garden. There are lots of varieties to choose from. Our favorites are thai purple and lettuce leaf basil. Unfortunately slugs and flea beetles are a pretty big fan of basil too, so maintain a steady supply by sowing the seeds at regular intervals throughout the spring and summer. Medicinal Properties: Basil's scent can perk up your energy level and it is filled with luteolin, a bioflavonoid that studies have shown to be the best protection of cell DNA from radiation. Basil is also a natural disinfectant, improves appetite, and acts as a good insect repellent. Must have biennial, rich in vitamin C, that has endless uses in the kitchen. Soak seeds in water before sowing to speed up the germination process. This herb is short-lived and has tiny green leaves. Medicinal Properties: It is said to inhibit tumor-cell growth while stimulating the digestion and the uterus. The leaves have some itch relieving properties if applied externally. It helps to cleanse the blood and boosts circulation and eases muscle spasms. Oregano needs a lot of light to grow so find a window with direct light or grow out-of-doors. Medicinal Properties: When you're suffering from cold or flu, steep oregano in a pot of water and inhale the vapors, which are antibacterial, antiviral and decongesting. This immunity-enhancing herb also settles digestion and prevents bloating. Rosemary grows on a small evergreen shrub belonging to the Labiatae family that is related to mint. Its memorable flavor and unique health benefits makes it an indispensable herb for every kitchen, and tastes great with sweet or savory dishes. Makes for a great cocktail mixer too. Medicinal Properties: Rosemary contains volatile oils that help stimulate brain activities and increase brain alertness. It also aids in digestion and perks up your immune system. Rosemary succeeds best in a light, rather dry soil, and in a sheltered situation, such as the base of a low wall with a south aspect. On a chalk soil it grows smaller, but is more fragrant. Pungent, aromatic perennial herb that likes dry, sunny situations and is full hardy. Not worth picking in the winter because its leaves wont have much flavor, so its best to dry them out on the summer time while they are plentiful and pungent. Medicinal Purposes: Anti fungal, anti septic, controls coughing, can help treat hair loss and dandruff. Hardy perennial with spear shaped leaves with a fresh lemony flavor. Perfect for salads, soups and sauces. Medicinal Properties: It is an extremely rich source of vitamin A, B9, C and contains vital minerals such as potassium, magnesium, sodium, iron, and calcium. Sorrel contains nutraceleuticals that are very effective in treating and preventing a wide variety of diseases including cancer, hypertension, diabetes, and heart disease. Refreshing in a salad or add boiling water to make a tea. The varieties are endless. Keep in mind how invasive mints are. They are best grown in a container pot by themselves unless you want it to colonize your garden. Mint loves moist conditions so keeps it well watered, especially if it's in a pot. Medicinal Properties: It increases healthy gastric secretions, relaxes the intestines, soothes spasms, settles the stomach, and alleviates gas -- it can basically your best friend. can be your best friend. Peppermint is also rich in antioxidants that support good vision and cleanses your liver, helping to eliminate harmful toxins from your body. Lavenders thrive in the arid West, but are best grown as annuals or container plants in the South, as they do not thrive in areas of high humidity. By far one of my favorite herbs. Not only is it beautiful, but it has hundreds of uses. It is a fragrant aromatic, a relaxing herb, and it can be used in baking, lotion making, gourmet cooking, tea making, tinctures and much more. Medicinal Purposes: Relaxation, stimulates digestion, eases anxiety, tension, and headaches. Thrives in hot, dry conditions. This herb is often used in Greek and Mexican food. Classic addition to pizzas, beans, rice, and pasta salads. Medicinal Properties: Contains antioxidants, calms nerves, clears mucous from the lungs, relieves pain, improves digestion, brings on menstruation, lowers high blood pressure, stops bleeding. Aromatic flavor that brings warmth to any meal. Sage needs a warm, dry situation to retain its pungency. Perfect herb to add to stuffings or dishes made with beans or lentils. Medicinal Properties: Increases oxygen to the brain cortex and can help improve concentration. It may also reduce depression and anxiety. Sage is also used to treat bug bites, infections, and hot flashes from menopause. If it's happy it will grow into a small shrub, but maintain by pruning to prevent woody-ness and strike cuttings to create new plants. Tender annual that is also very easy to grow from seed, however it bolts very easily in hot weather. If you cut off the top leaves of the plants, rather than at the base, they will grow again and again. Harvest the coriander seed and grind into curries and other spicy dishes. Their leaves also add a warm anise-like fragrance and freshness to spicy foods. Medicinal Properties: energy tonic that can boost your immune system and smooth out your digestion. Chives are very easy to grow from seed. They take a while to get established, but you will have them for many years so its worth the wait. They die back in the winter but burst back the following year. They peak in early summer before the sun starts to stunt their growth. They need plenty of moisture without being drowned. You can grow ordinary chives (allium schoenoprasum) that have a mild onion flavor, or garlic chives (A. tubersum) that have a self explanatory taste. Chop up your chives and add to a salad, potatoes, or a sandwich. Use their flowers too! Medicinal Properties: they contain a substantial amount of vitamin C as well as essential minerals: potassium, calcium, iron and folic acid. May clear stuffy noses, prevent bad breath, ease stomach aches, strengthen the lower back, and improve poor circulation. This herb is kinda a big deal. Both seeds and leaves have a sharp, slightly bitter taste. Use dried or fresh leaves, knows as dilweed, to flavor soups, salads, chickpeas and potatoes. Sprinkle dill on sliced cucumber to make a sandwich filling. Medicinal Properties: cures indigestion, inflammatory, and treats hiccups. 1. Prepare the pot. Make sure that your pot has holes in the bottom for adequate drainage, otherwise your herbs will soak and rot to death. 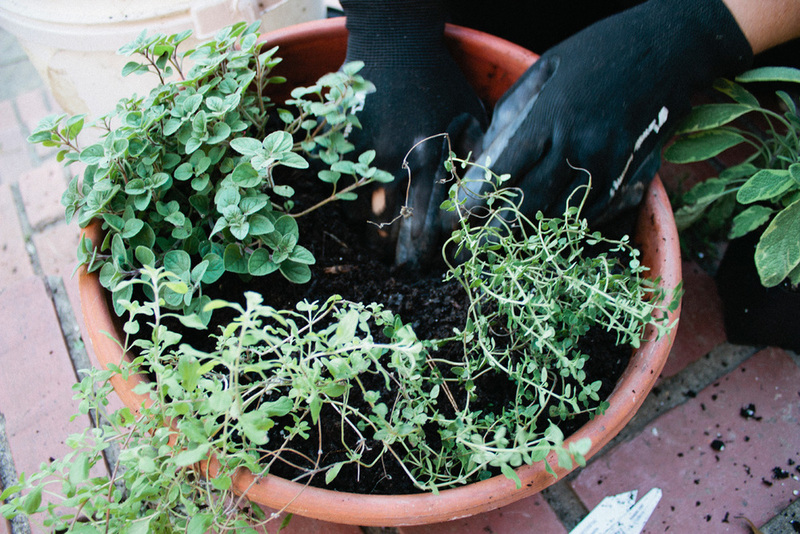 Line the bottom of the pot with potting soil -- use the good stuff! Something light and fluffy that creates lots of air space. 2. Know your herbs. Learn the growing requirements for the herbs you've selected. We've chosen plants that can be placed relatively close together for our small herb garden. Species that will grow tall can be placed in the back of the container. 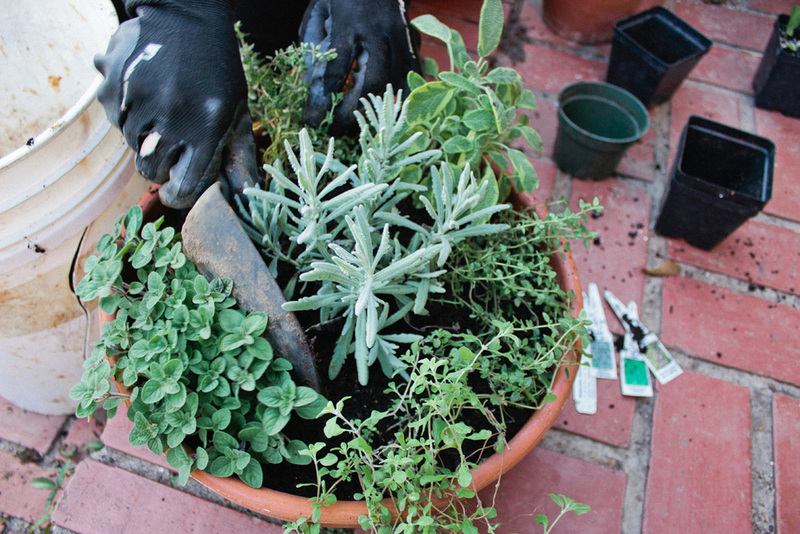 Also, decide where you'll place the container — most herbs grow well in full sun to partial shade. 3. Begin Planting. Start with trailer herbs along the side of the container (we used thyme, oregano & marjoram). Then place taller upright plants (lavender, rosemary, sage) in the center of the display. This will ensure the best growth. This display may look messy at first, but it will start to fill out and look lush within a few weeks. 3. Once you are happy with the positions of the herbs fill the gaps with a little extra soil by firmly pushing it into the soil without damaging the roots. Leave an inch or two between the pots rim and the soil, so the pot does not overflow when watered. 4. Water thoroughly every day until the roots get fully established. Then you can water every 3-4 days. Herbs like to dry out between watering, but be mindful if you are using rosemary because it can easily be over watered. Herbs love full sun but can stand 3-4 hours of shade. After a few months keep an eye on your container garden, if your herbs look overcrowded like they might need a trim or deserve to be transplanted to a garden bed. For our container, we chose to plant thyme, oregano, marjoram, lavender, rosemary, and sage. All herbs courtesy of Tallahassee's own Native Nurseries.